This book collects seventeen previously published essays by John Armstrong concerning the British coastal trade. Armstrong is a leading maritime historian and the essays provided here offer a thorough exploration of the British coastal trade, his specialisation, during the period of industrialisation and technological development that would lead to modern shipping. The purpose is to demonstrate the whether or not the coastal trade was the main carrier of internal trade and a pioneer of the technical developments that modernised the shipping industry. 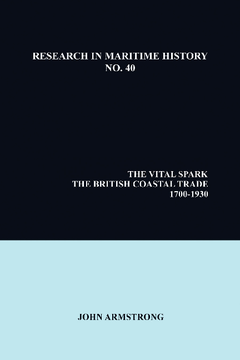 Each essay makes an original contribution to the field and covers a broad range of topics, including the fluctuating importance of the coastal trade and size of the coastal fleet over time; the relationship between coastal shipping, canals, and railways; a comparison between the coastal liner and coastal tramp trade; the significance of the river Thames in enabling trade; coastal trade economics; maritime freight rates; the early twentieth century shipping depression; competition between coastal liner companies; and a detailed study of the role of the government in coastal shipping. The book also contains case studies of the London coal trade; coastal trade through the River Dee port; and the Liverpool-Hull trade route. It contains a foreword, introduction, and bibliography of Armstrong’s writings. There is no overall conclusion, except the assertion that coastal shipping plays a tremendous role in British maritime history, and a call for further research into the field. Chapter 3 : The British Coastal Fleet in the Eighteenth Century: How Useful Are the Admiralty's Registers of Protection from Impressment? Chapter 10: Liverpool to Hull - By Sea?